7/31/2015 is a special day, Lisa. Before we delve into your past, what does Guru Purnima mean to you as you reflect on Guruji? Guru Purnima is held sacred in the yogic tradition because the Adi Yogi ( 1st Guru) opened up the possibility for a human being to evolve consciously. I feel that all relationships are magical and mystical if one has the ability to raise one's consciousness. All the beings that come into my life have a message and a teaching. I can sometimes sense this very clearly and sometimes not at all. There was never a moment's doubt in my heart about the guiding light of Sri K Pattabhi Jois! I actually did not seek or even look for him, but his magnetism, love and wisdom pulled me to him. I believe at that time in 1992, outwardly I was very young or too engaged in the material world to actually think that I needed to find a Guru to help me become enlightened. A lot of my time spent with Guruji was without words. The communication was physical on a gross level, but it worked in many intangible/subtle ways. He opened the door to the experience that I am not my body and then grace pushed me through. I had been studying Yoga somewhat seriously through the Sivananda lineage and with my teachers David and Sharon from Jivamukti Yoga. Both of these systems incorporate authentic yoga philosophy. I had been hearing, singing and reading: I am not this body, I am not these thoughts. This seemed somewhat logical, but there I was often feeling stuck with the normal busload of physical and mental sufferings. I was falling in love with the teachings of yoga, but it was more of a falling than a committed path of experience and realization. Guruji altered me. Practicing asana with Guruji was the most exciting and scary part of each day I was with him. At times I felt that I failed on my side of the Guru-Disciple relationship. He was always saying, “Yes, you do” and with ignorance and old imprints in the driver's seat I could hear someone replying, “No not me, I can’t”. One of the incredible things about Sri Krishna Pattabhi Jois was that he never believed in my false concepts of self and what I was or wasn’t capable of. He never gave up on me even though I lost faith in myself plenty of times. In April of 2009, I planned to be in Mysore a month prior to the first teacher training that Sharath would conduct. Guruji was so ill that Sharath who was touring the states at that time, had to ditch the last US events to return home and be next to Guruji’s side. Because of bad weather I lost my original flights and found Sharath and family on the same flights from San Francisco to Bangalore. I had heard from a friend that morning that Guruji was ill and so there was emergency tension looming throughout the flights entering Mysore. Some days later I was able to spend a couple moments at his bedside. I kept hearing Guruji silently saying, “Yes you do." I replay personal images, words, strong loving smiles and kisses of Sri K Pattabhi Jois daily as a source of inspiration to my path. His body no longer heals and morphs me in those seats of preparation but his mark is written with a beautiful pen across my heart. I grew up in movement. I often ate while dancing. I relied on the rhythm of movement to feel at ease. I can remember afternoons in grade school taking the train twenty minutes to attend a dance school that was several towns away. I felt that movement and dance were refuges to the suffering of adolescence and just a general feeling that things weren't all right in my world. I moved to New York City when I graduated early from high school to attend Alvin Ailey Dance school on scholarship. I then begin to dance in companies that toured the US but found the performance aspect of dance less and less appealing. In my early twenties, I was brought by a friend to a music studio/yoga room on Avenue A and 7th street and there I was introduced into asana, kriya and meditation. I started practicing yoga in the Jivamukti style with David Life and Sharon Gannon. They were my first major teachers, and recommended that I travel with them to India to take practice with Guruji, but I ended up learning Ashtanga from a friend of mine, Ruth Lauer Mannenti. We lived together in a studio apartment in New York City, and every day we practiced first series facing each other. She had gone to India and studied with Guruji and she passed on the lineage to me in our apartment on 10th street and Avenue A. This was in the 1990s. David and Sharon invited Guruji to New York, and I had an opportunity to practice with him in 1991. I remember that in that first workshop there werenʼt many people, maybe thirty with an early class and then another right after. About a year after that first workshop in New York, I went to Mysore for the first time. How was that initial Mysore experience? On that first visit I did primary for about one week then Guruji started teaching me, one by one, the poses from second series. I had learned almost the whole second series by that time from Eddie Stern, but it was fantastic to have Guruji on me daily teaching and assisting me, though some days I tried to hide from him, hah! Ashtanga is about transformation. We see that transformation not just from an asana perspective, but physical and emotional as well. As your body shifts with age, how do you adapt? How do you adapt emotionally during this transition phase? Many practitioners wonder about how long they can practice Ashtanga and if it is meant for people in their middle age or older? My asana teachers have always advised me to practice as long as you can, and that is how I am going to practice Ashtanga yoga. I am an Ayurvedic practitioner, and because of my studies, I understand not to push it beyond my limits. I practice in a way that enables me to still go out and teach and spread yoga for the rest of the day. I believe that this has been Gurujiʼs gift to me. This practice nurtures me and my own life so that I can then go and do something with that energy that is meaningful, at least that is my hope. If I am egotistically trying to hold on to what I could do when I was in my twenties, then I wonʼt have the intelligence and most likely the energy that I need to live my life in a yogic way. So I am careful. I believe my practice is changing and getting stronger, but of course it depends on what one calls stronger. I think that wisdom is more enduring than youth. Youthful strength is exciting and brilliant, but one who has endured and stuck to the practice has probably benefitted and transferred those benefits into many realms of their life. With wisdom one has more ability to withstand psychological and emotional struggles. In addition, with years of practice I have learned how to use my inner faculties, rather than my physical body, when practicing and teaching. Iʼve noticed that my lower back is less flexible than it used to be, but the bandhas stronger. I feel more able to gain the more important aspects of the practice like kindness. Students tend to underestimate how taxing teaching and adjusting can be. My work is assisting people and it takes a good amount of energy. I make sure to watch my energy levels so not to overdo it. So as a teacher, I try to do the most I can do, but I keep myself safe. If I am not safe, what good is it for the practitioner? If I injure myself, I am not setting a good example. Can you please share with us your thoughts on the aspect of teaching? There tons of assists we can do that donʼt require so much strain on the body. Guruji had his own method of teaching, which was very little vocal direction but many intense assists. I think each teacher has their own unique gifts that need to be cultivated for a long time with attention from a mentor and devotion to the lineage. The Ashtanga experience involves assists. Through them, one goes to places that one couldnʼt have gone alone. This leads the practitioner into a realization of their potential. One gets a great assist and thinks, “Oh! Anything is possible!”. One recognizes that as far as the mind can reach, they can go and of course ultimately beyond that. I try to get to know my students before I give them many assists. When I do know them well and get some understanding of what I think they need, I push them to find out how they can move through their boundaries. I use intuition and rely on the advice from my teachers so that it is a healing, not harming experience for all. 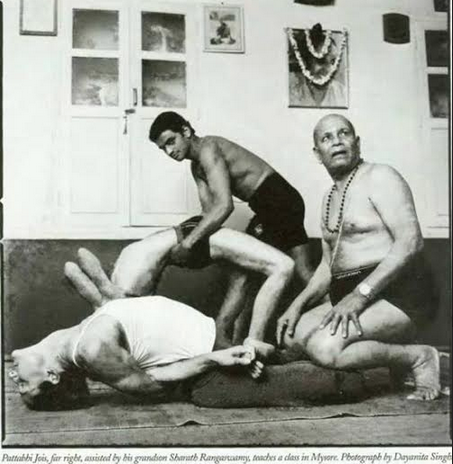 I can remember myself and many others complaining to Guruji about our “injuries”, invariably he would be so pleased and say “Oh opening, very good!” You have to keep in mind that itʼs not every day that you can push your boundaries. There are some days where you just want to maintain – you are just trying to get through your practice, and growth and expansion for those days may mean just unrolling your mat. The practice is meant to be daily, in fact every moment we can practice, so how I do this requires sensitivity and great kindness towards myself or else, itʼs just a practice that can border on bodily punishment. Developing trust is a part of the whole teaching process. Once your students know you and they feel safe, then there is the space for growth and learning on both sides. If someone is new, then there are fewer assists until that sense of safety is created. If one of my students has an injury, I help them pay attention to it, and I have them modify the practice. I think it is best if students continue practicing when they are injured, but to practice in a way that it doesnʼt aggravate the injury. This means they have to pay attention to any pain. If there is pain arising, then they need to focus on it and send energy into that place. Injuries usually preclude a huge awakening moment. Until we learn how to move through and understand the pain and injury, it will keep arising. Some students quit Ashtanga because they hurt themselves while practicing, and decide instead to practice another style of yoga. Then they hurt themselves doing this new practice and move to yet another. They keep trying to escape or change the internal landscape through the external practice, but the body has to accept all the karmas of our life. The body is subject to all of our negativity. When we have pain or an injury, instead of stopping what we are doing, we have to look again and look deeper and discover how to practice in a therapeutic way. We have to remember that we practice to relieve the pain and suffering. Injuries occur to give us an opportunity to grow and to deepen our wisdom in the practice. Part of the role of the teacher is to watch for signs of overexertion that might lead to injury. The breath is always a strong indicator if students are pushing too hard. For example, if a student stalls in a pose or just hangs out in downward facing dog for a long time, then that is where they should stay for the day. If a student canʼt really do a pose completely correctly but their breath if fine, then it is sometimes OK for them to move on. The digestion, assimilation and absorption of the pose is paramount for ʻstiram sukham asanamʼ. When someone comes to a pose they are afraid of or it is their last pose, then I am with them to make sure that they feel protected. I help them with their breathing, and I am adjusting their posture so that it is also right. Usually after someone takes on a new pose and practices it for a certain amount of time, there is a releasing of fear. Afterwards they can go deeper into the pose, and before you know it, they are ready for the next pose. Overall, my approach is to be safe rather than daring. I donʼt want anyone to be hurt because of my desire to give them another pose. I want them to feel happy, stronger, and healthier because of the practice. The practice isnʼt to do weird postures with our body. The practice can be a microscope into our own bodies and minds to see what is good, what needs to be transformed, and ultimately to arrive at the expanded, wholesome and free state. The practice is for everybody who wants to do it. Anybody who has the passion for yoga can practice, but you have to dedicate yourself. You canʼt expect to do much healing if you are a beachcomber with the practice. You have to make it a priority and a habit, sort of like brushing your teeth. I definitely believe in five or six days a week – with the moon days off. For brand new students, though, it may take some time to develop the devotion for the practice. All kinds of linkages have to be there for a person to say, “I really want to do this full-time”. It takes time, and I want my students to make this choice on their own, without feeling forced. My role isnʼt to push people, but to encourage them to develop a regular practice. Yoga is meant to help you develop inner trust and intuition, and so creating a regular practice has to come from that place. Emotionally I am in love with this practice and I am so excited when I meet another who also feels this way. I have spent time in Mysore with so many great practitioners and I feel like they are my relatives that I love to see. I am not much of a social butterfly, but when I meet someone who has been to Mysore, I tend to want to seek out our bond. Possibly this is because Sri K Pattabhi Jois is my mentor and I feel that many who travel to Mysore-- well, we have that bond. I canʼt help but fall for my students in a motherly, sisterly and brotherly way! If they stay in the Mysore room, there is a slim chance that I donʼt see their light and goodness. There are people who come and go and for me those bonds being more temporal make it more difficult to connect, learn and grow. That being said, when I travel to study with my teachers sometimes not receiving even one assist, I often feel that I have received much just by being in their presence and their place. Iʼve been teaching yoga since 1990, when I was certified to teach through the Sivananda school. When I returned to New York from that training, David and Sharon certified me to teach at Jivamukti. Guruji certified me to teach in 1997, and so Iʼve been teaching Ashtanga for about eighteen years. I love the system, and I love it for all people, even though many Ayurvedic practitioners would not recommend it for all. It is mostly recommended for a Kapha dominant person, although of course, Pittaʼs and Vata predominant really like it. Many Ayurvedic practitioners who advise people not to practice Ashtanga yoga donʼt really know what Ashtanga yoga is. Many look at the external look of the system and think that it isnʼt going to be good for a Pitta, too heating and for Vata too much movement. Being a longtime practitioner and having a Vata- Pitta prakruti, Iʼve come to understand that this isnʼt necessarily the case. Of course if you take a brand new asana practitioner who is very Vata aggravated, and donʼt take care in how you teach them primary series, then yes, it can aggravate Vata. The heat of the practice can aggravate the Pitta dosha. However if you teach, step by step, paying attention, teaching Mysore style and letting people progress at their own pace, then I think you can cure many illnesses and doshic imbalances, just as Guruji did and Sharath and Saraswati are doing. Can you talk about Guruji? Can you please also share about Guruji, the person? We can then dovetail it into Guruji the healer. Sri K Pattabhi Jois was and is a force of grace in my life. I feel so lucky to have met him and have him teach me over a period of sixteen years. He taught me in so many ways and I feel that many of those teachings have yet to have taken hold. I feel a strong connection to him now and hopefully with the continuation and deepening of my practice many more lessons will be undertaken. Being near to him felt magical and the deeper truth of what we are and what we are doing here seemed to be vibrating in the space he would hold. I never had to think, if I trusted him or believed in his enlightenment, I naturally knew and felt it was best to just absorb him, his presence and teachings as much as I could. Guruji cured all kinds of mental and physical health problems. He did much of this with his mind. One time when I went to Mysore, I was struggling with a meniscus problem. My right knee had been troubling me for probably ten years, and it was getting worse. My friends were advocating knee surgery, and I was debating whether I should have the operation or go to India. I decided I was going to go to India. When I got to Mysore, I told Guruji that my knee was really bad, and he said, “No problem, no problem.” And Iʼm replied “No, Guruji, it IS a problem.” but he was really insistent that there werenʼt any problems with my knee. He told me “to take practice tomorrow, no problem.” The next morning I practiced, and ever since that morning my knee hasnʼt hurt. Iʼm still very careful, but the injuries, or openings as Guruji called them, are incredible opportunities for us to be aware and to awaken. Looking back on the experience, I think that I was holding on to an idea that something was wrong with my knee, and my faith, karma and the Master fixed it. There is a huge devotional aspect to going to India to study for a month or longer. It brings out the blessings in oneʼs awareness. Do we all find the teacher that we love in the same city that we live? No. Sometimes it is good to move to that city where one does find their teacher. It is a good enough reason to move if you find a teacher you trust. Iʼve spent a good amount of time going to and staying in Boulder because of Richard Freeman. David and Sharon, of course are great beings in my life. Eddie Stern is a great teacher and when I am in New York I get to study with him. I have immense faith in all of these people, so they can take me into a very deep practice. If I am with someone that I donʼt trust, then I notice that I become more reserved in my practice. I practice by myself, and Sharath and Saraswati are my teachers as well. When I am with Sharath, I will try almost anything he asks, because I have the faith in his understanding of me and the practice. This is important – we are dealing with things that are very precious to us. The human body is my tool, so I donʼt just want to hand it over to anybody. My advice for new Ashtanga yoga practitioners is to go slowly and to study what you are practicing. This means studying not only physically what is happening in your body, but also spending some time developing the devotional and spiritual aspects of the practice. It is important for one to practice Svadyaya, self study, as well as study of the yoga texts, understanding that Ashtanga yoga is Yama, Niyama, Asana, Pranayama, Pratyahara, Dharana, Dhyana, Samadhi and know what text that comes from. It is good to study the philosophy so that one’s mind is able to understand the context of where this practice comes from and that it is not just a physical practice. The practice can deliver amazing things if we are open to it, to the teacher and to the system. But even if one is not inclined to study the sacred texts, the point is still communicated in a room when the teacher has studied and traveled the path with completeness or sometimes sincerity is enough. Sri K Pattabhi Jois had both. Being in the shala with him was totally inspiring and electric. He made time stand still as his feet stepped near your mat. I think he was constantly praying for all of his students. When I chant I try to bring him into the room for direction, protection and guidance. Then I watch with great attention to try to be of service.